The Yonanas turns overripe bananas and other frozen fruits into healthy desserts. We made three desserts using banana and mango; banana and berries; and rockmelon, pineapple and banana. Overall, we were impressed – each combination had a creamy texture like ice-cream. It’s easy to use and once you have a supply of frozen bananas in the freezer, you can have dessert ready in minutes. To use, you need to peel bananas, chop them into chunks and freeze for at least 24 hours. Extra-ripe bananas work best – the more brown spots, the sweeter your dessert will taste. For the best consistency, slightly thaw the frozen fruit for 10 to 15 minutes before using, then lock in the chute and place a bowl under the dispenser. Insert a banana chunk, then a handful of frozen fruit (if using) and repeat. Use the plunger provided to push the frozen fruit through the chute. When it comes to flavour combinations, you’re limited only by your imagination (and the size of the chute). Or consult the internet for inspiration. Yonanas' website brings up recipes for flavours like cookies and cream, peanut butter and jelly, and rocky road. There are a couple of downsides. We found that when combining two or more fruits, they didn’t always combine together evenly (as they’re added to the chute alternatively). And the last bit of fruit fed into the chute could get clogged and didn’t always get processed. The dessert melts quickly so it’s best eaten as soon as it’s made. Or put it straight into the freezer to firm up for an hour or two before eating. 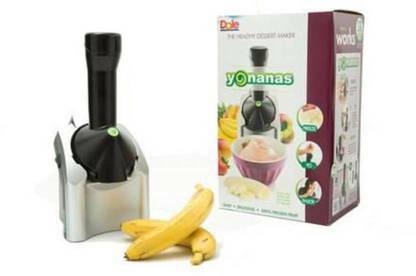 The Yonanas is a compact unit that's easy to use and store. The small chute means you have to chop your fruit into small pieces. It's noisy but this isn’t surprising as it’s processing frozen fruit. It’s reasonably lightweight so it can easily move on the bench if knocked. It's very easy to clean – all components are dishwasher safe. If you need to remove any clogged fruit, simply rinse under hot water to melt it away. The frozen desserts made using the Yonanas are a great alternative to ice-cream. If using only fruit, they’re low in fat, contain no added sugar or preservatives and are dairy-free. The best results are achieved when you use banana as the main ingredient as it gives it a creamy consistency, but mango and rockmelon work well as an alternative and give more of a sorbet texture. Tip: If you have a Vitamix, Thermomix or any other powerful blender or food processor, you can achieve a similar result by freezing your fruit and blending until you achieve an “ice-cream” consistency. When using a blender, you may need to add a small amount of water, milk or cream.